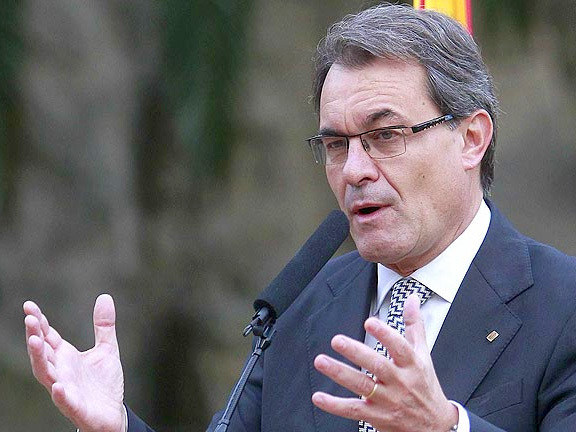 In an interview with the Italian newspaper La Repubblica published on Friday, the President of the Catalan Government, Artur Mas, emphasised that an independent Catalonia would “want to remain” within the European Union. Mas highlighted the need to reach “a transition agreement” in the event of an independent Catalonia in order to ensure its uninterrupted continuity within “the Eurozone, the EU, the Schengen Area and the NATO”. This “transition regime” should ensure that Catalan citizens and companies continue benefiting from EU rights, while contributing to the EU budget, from the first day of Catalonia’s independence to its full-membership as an independent state. In addition, Mas insisted that, if the Spanish Government bans the self-determination referendum, he will have to call plebiscitary elections in order to give Catalans the opportunity to vote on their collective future. Besides, Mas announced he “will quit politics soon”; “at most” he will be in office for just “another term” to “push forward the [self-determination] process”. La Repubblica’s interview is mostly focused on Catalonia’s self-determination process, the reasons to call for such a vote and the need for independence from Spain. The President of the Catalan Government emphasised that the self-determination referendum “will take place” one way or another. If the Spanish Government does not allow a referendum or a specific consultation vote on this issue to take place, Mas pointed out that plebiscitary elections would be called. In theory, the next Catalan elections should take place around November 2016, but the Catalan President has the power to call them earlier if he deems it best to do so. By holding plebiscitary elections, Catalans would in any case have the opportunity to vote on Catalonia’s political future. Artur Mas explained that, at personal level, supporting independence was “a complicated but necessary” move. He also rejected the idea that Catalans should mistrust his pro-independence views because he had not expressed them earlier in his life. On a more private note, Mas announced he is thinking about quitting politics “soon”. “Personally, I only have disadvantages [out from politics]. Only big problems […] I think I will quit politics soon”, he stated. However, immediately after he nuanced his statement and added: “At most, I will stay in office for another term, if the conditions to push forward the [self-determination] process are met”, he said. In fact, Mas is linking his political future to Catalonia’s self-determination issue; in previous interviews he already said he would remain in office to pilot the process and, when it ended, he would retire. “I want to go back to my life”, he said in the interview with the Italian newspaper, as he feels “tired”. Nonetheless, he said he carries on because “it is needed”. In the event of a separation between Catalonia and Spain, the banks and other economic sectors would not oppose it, said Mas, who was Catalan Minister for Finances and the Economy between 1997 and 2001. “Banks are not interested in politics; they look for profitability. Catalans have an income per capita of € 27,000, like the Germans. Spanish banks have 20% of their market here [in Catalonia]. Ideals do not exist in the business world, there is only [economic] interest”, he underlined. According to him, these economic interests would lead banks and multinationals to not oppose independence and work for a smooth adaptation to the new political framework. In response to the common idea that an independent Catalonia would automatically be out from the European Union, Mas insisted that Catalonia is proposing “a negotiated” process within the legal framework. In this vein, he said the European Union should listen to the “will” of the Catalan people to ensure a smooth accession within the EU as an independent state. “It would be a pity to be out from the EU, because we want to remain within it. We have to reach a transition agreement to avoid being expelled from the EU. We want to remain within the Euro, the Union, the Schengen Area and the NATO”, he stated. In fact, the Scottish Government suggested in its White Paper for independence a similar formula. The Scottish Government proposed that, in the event of independence, a transition protocol should be negotiated between the day after the referendum and the day before independence. Then, this protocol would be in place from the first minute of independence to ensure that EU Treaties continued being in force for Scots and companies working in Scotland, so they could have all the EU benefits. Meanwhile, a fast-tracked accession could be negotiated and approved to have Scotland as an EU Member State on its own right.